Norris Church Mailer is a lot of things: a daughter, a mother, a wife, a student, a teacher, an artist, a model, a writer, a scenester, a cancer survivor. 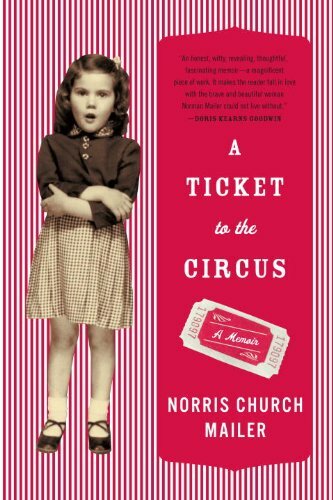 In her candid, revealing memoir A Ticket to the Circus, Norris reflects on her youth in Arkansas, her marriage at age 20 and then meeting and marrying writer Norman Mailer at age 26. Young Norris [then Barbara] dreamed a lot and knew that she wouldn’t stay in Arkansas forever although she enjoyed being close to her family and loved the state. Norris ached to get out and travel and see the world. Norris also knew that there were challenges beyond any she could find in Arkansas that she needed to discover on her own. She attended college and took to art classes and ended up teaching art at a high school for several years. Norris invited herself to a party after Norman’s book reading and he immediately became smitten with the red-haired enigmatic and confident young woman. Not long after, Norris moved to New York to be close to Norman and she immediately fell in love with the city. Clod or angel, there are many reasons we lasted for thirty-three years, aside from the physical passion, which was as intense decades into the marriage as it was at the beginning, if not as frequent. As trite as it sounds, I think we stayed together because we really loved each other, we loved our kids, we loved our life, and we were comfortable together. We had each found someone whose quirks and habits we could live with, like a key in a lock. Besides, if I had left him, as I seriously considered only once, I would have always wondered what he was up to, and would have been miserable in my curiosity. Nearly twice her age, Mailer complemented Norris and the two remained married for thirty years. Norris became Mailer’s sixth and final wife. The most appealing aspect of Mailer’s memoir is its friendly, conversational tone and her ability to weave a wonderful story. She recalls mostly good times with Norman but there were struggles that many couples go through as well. Norris came into Norman’s life as his mistress but it still shocked her to find out that he’d been having affairs about 15 years into their marriage. Norris provides insight into living with a famous and talented man as well as making the social scene around New York. There are glamorous parties, celebrity friendships and also the real day-to-day ins and out of a marriage. There’s that certain ennui which couples often face. There’s the inherent conflict between two creative, career-driven types and also for two people with close family ties. Fortunately for Norris and Norman, this worked to their advantage. A Ticket to the Circus is an autobiography about a strong, determined woman with an immense capacity to love, to care for others and to create beautiful things. It’s also an intense love story about a seemingly mismatched but ultimately perfectly paired couple. This is one memoir not to be missed. This entry was posted on April 25, 2010, 21:10 and is filed under Books. You can follow any responses to this entry through RSS 2.0. Both comments and pings are currently closed.